Sibley, IA-Osceola Community Hospital celebrated the 4000th donation of blood to the Community Blood Bank since partnering with them to provide blood to the hospital over 13 years ago. With just one unit of blood a person can save up to three patients’ lives. The blood is processed into platelets, plasma and red blood cells after the donation is completed. The three components may go to three individual hospital patients, saving up to three lives. Donors must be at least 17 years old (16 years old with a signed parent consent form found at cbblifeblood.org), weigh 110 pounds or more and be in good general health the day of the donation. Please bring an I.D with you. Donors must be at least 17 years old (16 years old with a signed parent consent form found at www.cbblifeblood.org), weigh 110 lbs or more and be in good general health the day of the donation. Please bring an I.D. It is recommended that a person eat and drink plenty of fluid prior to donating. For more information log onto www.cbblifeblood.org or call Osceola Community Hospital at 712-754-2574. Community Blood Banks is a nonprofit, cooperative of Sanford and Avera Health and the sole blood provider to 34 local hospitals. 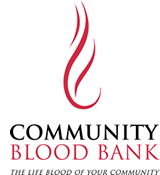 Community Blood Bank is not associated with any other blood bank organizations.